Gordon Lee's McCain Barbee, left, congratulates Mason Pettigrew after a catch in the Class A public state championship series in 2017. Allatoona scored 37 runs and defeated Osborne 37-0 in a Region 6-6A battle Friday night. The Buccaneers played 17 players in the game and 16 had at least one hit or more. The national record according to the National Federation of State High School Associations is 109 set by Atlantic (Iowa) who defeated Griswold (Iowa) in 1928. In Georgia, Athens scored 67 in a game against Royston High in 1948. Lowndes has won seven straight and made its season debut in this week's Class 7A polls. The Vikings have won four straight region games and not allowed a run. Junior Cameron Carter is 5-0 with a 0.41 ERA in 34 innings with 40 strikeouts. Offensively, the Vikings are hitting .318 with a trio of players hitting .400 or better. Sophomore shortstop Tyler Andrews is hitting .428, senior Tyson Shaw .404 and junior C.J. Rose is hitting .401. Dominic Canale and two other pitchers combined to allow just two runs on four hits as Mountain View upended Parkview 9-2 in a nonregion game on March 24. The Bears, who made their debut in the Class 7A rankings this week, got a 5-for-5 performance at the plate from Andrew Phanmanee and a 3-for-4 performance from Garrett Spikes, who added a homer and four RBIs. Parkview went 3-1 during the week of March 19-23 and got strong offensive performances from Jonathan French (4-for-6, three RBIs, three runs), Logan Cerny (7-for-12, three doubles, four RBIs, six runs) and Jon Ponder (5-for-9, three runs). Braden Hays and Robert Bennett had strong performances on the mound last week. Hays allowed just three hits and struck out 10 in his five innings, while Bennett allowed just two hits and struck out 10 in his five innings. After Walton, last week’s No. 3 ranked team, defeated defending state champion Etowah 7-4 on March 21, the Eagles rallied and took a pair of shutout victories on March 23 in Region 4. Dustin Frost’s grand slam helped Etowah to an 8-0 victory in the first game of the doubleheader behind Ethan Underwood’s six-inning pitching gem. He allowed just two hits before Brandon Harry finished up the final inning. Jackson Sisk, Niko Cho and Nick Block also had two hits each. Then Nick Torres and Bryant Madden combined on a two-hit shutout in the second game, a 6-0 victory. Conor Bowen went 3-for-4 at the plate, while Frost went 2-for-3 with an RBI. Frost finished the night 3-for-6 with a grand slam and five RBIs. Woodstock improved to 16-3 on the season with a three-game sweep of Roswell. The Wolverines were led at the plate by Troy signee Caleb Bartolero who batted .455 with a double and three RBIs during the week. Sophomore Cooper Torres batted .455 with two doubles, two RBIs and a stolen base, while junior Brennan Milone batted .429 during the stretch with a double, a homer and scored five runs. Senior pitcher Zach McManus earned a complete-game victory allowing just a hit with 11 strikeouts. He was perfect through 5 2/3 innings before allowing his only hit. Pope won its eighth straight game on March 23 with a 5-4 decision over Cambridge in Region 7 play. Andrew Feld’s walkoff homer helped the Greyhounds improve to 15-4 on the season. Feld finished the game 2-for-4, while Caden Smith also added two hits. Flowery Branch pitcher Zander Sechrist allowed just one run on seven hits to earn a 2-1 complete-game victory over Loganville March 23 in a key Region 8 contest. Sechrist struck out eight. His only blemish was a solo homer he allowed to Dylan Strickland. The Falcons managed just two hits, but they made the most of them. AJ Gonzalez had an RBI single, while Andrew Armstrong added an RBI triple. In a 6-1 victory over Miller Grove on March 22, Arabia Mountain pitcher Tyler Suber hurled a no-hitter, while Silas Buter went 4-for-4 on offense with a pair of RBIs. In a 4-0 victory over Southwest Dekalb on March 20, Jay Sterling improved to 5-0 on the mound with a two-hit shutout. He has a region-leading 1.33 ERA in Region 5 play. Sterling has 21 strikeouts. Thomas County Central went 5-0 during the week with wins over Cairo, Tift County, Warner Robins (twice) and Bacon County. Perhaps the most impressive stat during the stretch was the Yellow Jackets’ pitching staff. In the five wins, the team pitched 31 innings, struck out 20, allowed just eight walks and finished with a 1.16 ERA. Junior RJ Delaney earned two victories after throwing 8 1/3 innings. He allowed a combined eight hits, two earned runs and struck out 10, while junior Luke Benton earned a win and a save in 7 1/3 innings. Offensive leaders were juniors Nick Herndon (6-for-13, double, two triples and six RBIs), Jackson NeSmith (10-for-16, double, triple and eight RBIs), Slade Taylor (7-for-13, 2 doubles, five RBIs) and Shane Stephenson (6-for-16, double, triple and six RBIs) . Cartersville went 3-0 last week, including a 5-0 victory over then-No. 3 Troup in a key Region 5 game. Part of the Hurricanes’ success was because of senior Anthony Seigler who hit .556 during the stretch with two homers, a double, five RBIs and four runs scored. He also combined with starting pitcher Mason Barnett to hurl a shutout against Troup on March 23. The duo allowed just four hits with Seigler working the scoreless seventh inning. It was a big week for Stephens County as they opened up Region 8 play against Oconee County in a three-game set. Stephens won the first game 10-4, but things got tougher in the second and third games. The Indians won both games with seventh-inning walk-off victories. Stephens took the second game 4-3 when Dawson Dean’s single scored the game-winning run. 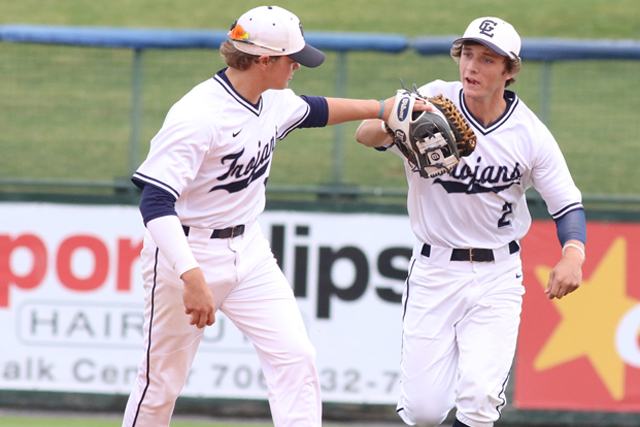 In the final game of the set on March 23, Stephens County scored four runs in the bottom of the seventh inning against Oconee County to take a 5-4 victory and helped the Indians, who have won nine straight, to a sweep. After Dawson Sorrells singled to score Davis Swenson on an RBI single with two outs, Chaz Bridges’ RBI single scored Griff Pruitt for the game-winning run. Swenson also earned the Game 1 victory on the mound to improve his record to 5-0 on the season with a 1.75 ERA. He has 42 strikeouts in 32 innings. Sorrells earned the Game 2 win to improve his record to 5-0 with a 1.58 ERA. Bryson Fowler was the winning pitcher on March 23. He is 1-0 with four saves and a 0.00 ERA. Offensivey, Austin Page and Zach Boyd each hit .429 for the week. Westover went 1-2 during the week of March 19-24. In a 10-0 victory over Americus-Sumter on March 20, Kedarrius Cunningham allowed just two hits, no walks and struck out seven batters in the six-inning victory. Davis Spalinger allowed just three earned runs, struck out five and allowed no walks in a five-inning outing against Cairo on March 22, while Nick Mitchum allowed just two earned runs, allowed no walks and struck out seven in a loss to Northside-Columbus on March 23. Mitchum threw six innings and also batted .300 on the week and stole three bases. Fannin County lost two of three against Greater Atlanta Christian in Region 7 play last week. However, nobody could fault leadoff hitter Chandler Kendall who finished 6-for-11 in the three games with two doubles, a homer and five RBIs. Pierce County’s Cody Williams hurled a complete-game shutout in a 9-0 Region 2 victory over Brantley County on March 22. Williams allowed just three hits and struck out 13. He also added a double. He was helped by Walker Sinclair, who finished with three RBIs. Top-ranked Ringgold has won nine straight and defeated North Murray, Coahulla Creek and Haralson County the week of March 19-24. Pitchers Nathan Camp and Casey Pate combined to shut out North Murray on March 20. Camp struck out nine in five innings. Holden Tucker didn’t allow an earned run in six innings of an 8-2 victory over Coahulla Creek on March 22. He struck out seven. Wyatt Tennant struck out 10 and didn’t allow an earned run in five innings of a 9-1 victory over Haralson County on March 23. Offensive leaders during the three games were Gavin Hollis (7-for-11, homer, five RBIs), Ty Jones (3-for-10, three RBIs), Andre Tarver (5-for-8, homer), Daulton Schley (4-for-11, four RBIs), Tennant (3-for-10), Tucker (5-for-9, three RBIs) and Dylan Wright (5-for-6). Cooper Brown’s single in the eighth inning scored Trey Thomas to give Bacon County an 8-7 walk-off victory over Toombs County on March 23. Benedictine has won 11 straight games and leads the Region 2-2A standings. The Cadets took a pair of games from Bryan County this past week. Carter Holton and Walker Barlow earned victories on the mound. Holton struck out 13 in 5 2/3 innings on Tuesday, while Barlow allowed just two unearned runs in six innings to earn the victory on March 23. Garrison Gunby went 2-for-5 with a two-run homer and six RBIs in the two games, while Johnny Richardson finished 3-for-6 with four RBIs and a double. Holton finished the week 4-for-7 with a homer. Berrien’s Brock Jewell allowed Thomasville just one run on two hits while striking out 12 in a 5-1 victory on March 20. Then, Thomasville paid the Rebels back with a doubleheader sweep on March 23. JT Rice’s RBI single in the bottom of the seventh inning in the first game on March 23 gave Thomasville a 2-1 victory. Then Jacob Bradshaw hurled a two-hit shutout to help the Bulldogs to a 3-0 victory in the nightcap. Rice finished 3-for-7 at the plate with three RBIs in the three games against Berrien. Fitzgerald has won six straight games and leads the Region 1-2A standings by a game over second-place Thomasville. Rockmart has won seven straight and opened up a two-game lead in the Region 7 standings. The Yellow Jackets defeated Coosa 4-1 on March 20. Pitchers Brayden Cole, Griffin Pace and Johnathan Suppes combined to allowed Coosa just one run on seven hits. Cole finished 2-for-3 at the plate with a pair of doubles and an RBI. Baconton Charter took a pair of Region 1 victories over Randolph-Clay on March 29 to remain in the thick of the region chase. The Blazers won 15-0, then took a 20-2 win. In the 15-0 rout, Gregory Manning went 2-for-2 with two doubles and two RBIs to lead the offense. In the 20-2 victory, Haden High was 2-for-2 with a homer and three RBIs. The Blazers (9-4) dropped a 7-1 nonregion contest to Worth County on March 27. Baconton is 9-4 on the season. Zach Smith scored the go-ahead run for Irwin County on Reid Fletcher’s groundout in the top of the sixth inning to help the Indians defeat Clinch County 4-3 on March 23. The Indians have won five straight and lead Charlton County by a half-game in the Region 2 standings. Adam Hooks went 2-for-4 and was the winning pitcher in the Trojans’ 7-1 victory over Jenkins County on March 27. Hooks went 6 2/3 innings, allowing just a run on five hits. He struck out six. Dre Darrisaw went 2-for-3 with an RBI, while Hunter Wilkerson added an RBI triple. The Trojans defeated Wilcox County 11-2 on March 29 before falling to Savannah Christian 3-1 on March 30. Johnson County is 14-4. After Schley County defeated Hawkinsville 2-0 in Region 4 play on March 20, the Wildcats took a pair of wins from Georgia Independent Schools Association power Westfield on March 22 and 23. Schley won 12-3 on March 22, then needed 12 innings to defeat the Hornets on March 23. Camron Belcher scored on a passed ball to break a 2-all tie in the top of the 12th before Dakota Albritton’s RBI single scored Dylan Taylor. Lorne Barineau pitched the final five innings, including a scoreless bottom of the 12th for the victory in relief. Seminole County scored three big Region 1 wins. The Indians defeated Terrell County 4-1, Webster County 13-1 and scored a big 9-2 win over Pelham on March 30 to improve to 11-7 on the season. Gage Jones went 2-for-3 to lead the offense, while Garrett Taylor was 1-for-2 with a triple and three RBIs. Freddie Reams’ single in the bottom of the seventh scored John McNair and Harrison Padgett and helped Holy Innocents to a 5-4 victory over Wesleyan in a battle of Region 5 leaders on March 24. Jack Alexander’s RBI single in the bottom of the eighth inning helped Mount Paran Christian to a 4-3 victory over Walker March 22 in Region 6 play. Luke Laskey’s RBI single in the top of the seventh scored Logan Fink and helped top-ranked Tattnall Square sweep a pair of games from First Presbyterian Day last week. The Trojans won 5-4 on March 23 after defeating FPD Fink finished 2-for-4 with two doubles, while Brooks Gorman and Trey Ham also homered for Tattnall Square. Gorman earned the victory in relief. Garrett West had a two-run homer, while Harrison Aulds finished 2-for-3. Laskey and Dawson Brown combined on a shutout in a 4-0 victory on March 20.